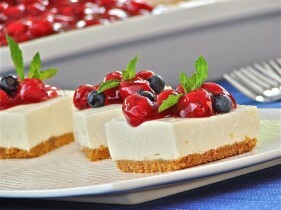 Your dinner guests will be very merry when they taste this light-and-lemony cherry cheesecake. A crowd favorite! To make crust, combine graham crumbs and cinnamon in a medium bowl. Add melted butter and stir using a fork until crumbs are moistened. Spray a 9 x 13-inch baking dish with cooking spray. Press crumb mixture firmly and evenly over bottom of dish. Refrigerate while you prepare the filling. Measure lemon juice in measure cup. Sprinkle gelatine over lemon juice and let stand for one minute. Add ¼ cup boiling water. Mix well, until gelatine is dissolved. Set aside. To make filling, beat together cream cheese and lemon juice mixture on high speed of electric mixer until smooth. Add sour cream, sweetened condensed milk and lemon zest. Beat again until well blended. Pour filling over prepared crust and spread to edges of pan. Cover and refrigerate for at least 3 hours until set. Spread cherry pie filling over cream-cheese mixture. Cover and refrigerate until ready to serve.